The International Forum for Investor Education (IFIE) and the International Organization of Securities Commissions (IOSCO) today opened their seventh annual investor education (IE) conference in Kuala Lumpur, Malaysia with a focus on the best strategies for improving investor engagement in order to build financial capability (FC). Concluding Wednesday, the IFIE/IOSCO conference is hosted by the Securities Commission of Malaysia (SC). The full agenda, including panels, skills workshops and keynote speakers, may be viewed at www.ifie.org/2015conference. Throughout the conference, speakers, panelists and practitioners hailing from 30 countries will focus on how the varied layers and perspectives in FC/IE can be leveraged to make programming more successful. Emsley Tromp, President, Central Bank of Curaçao and Sint Maarten. The evolving roles for the public sector–regulators, Self-Regulatory Organizations, central banks–in delivering investor education programmes. The 2015 IFIE/IOSCO conference is sponsored by FINRA (United States), Securities Investor Protection Corporation (United States), CFA Institute (United States), ANBIMA (Brazil), TCMA (Turkey), CSI Global Education Inc. (Canada), JSDA (Japan), and the CFTC (United States). 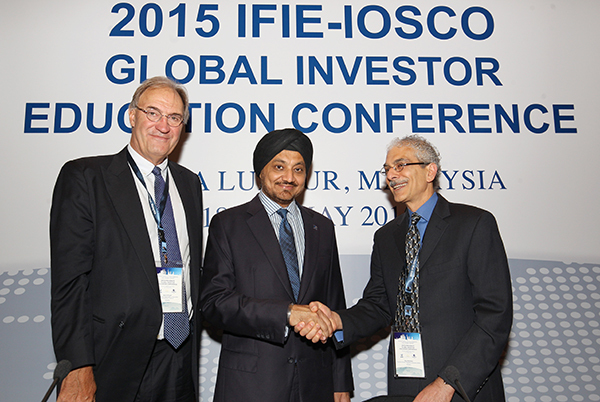 (From left) International Organisation of Securities Commissions (IOSCO) Secretary-General David Wright, Securities Commission Malaysia (SC) Chairman Ranjit Ajit Singh, and International Forum for Investor Education (IFIE) Chairman Paul Andrews at the 2015 IFIE-IOSCO Global Investor Education Conference in Kuala Lumpur, Malaysia. 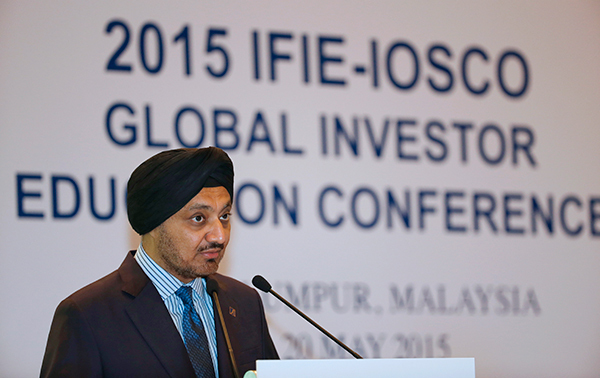 Securities Commission Malaysia (SC) Chairman Ranjit Ajit Singh delivering his keynote address at the 2015 IFIE-IOSCO Global Investor Education Conference.